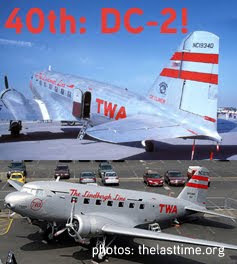 "Top Secret" 40th Entry is Rare DC-2! The organizers of the massive and historic DC-3/C-47 formation flight into Airventure 2010's opening day have finally announced the details on that closely-guarded aircraft that is now signed up to complete the 40-plane armada. in California. The Captain that will guide N1934D on the formation flight is also pretty well-known around VNY: Clay Lacy. This Douglas DC-2 is one of only two examples remaining in the world. Built in 1934, it was first sold to Pan Am and saw service in South America for many years as an early South American Airliner. It returned to the United States and eventually wound up in the Dakotas owned by Johnson Flying service and was used as a smoke jump aircraft dropping firefighters into US forestry areas as well as training jumpers on practice runs. It was recognized as a national treasure and bought by the Douglas Historical Society and remained in California roughly 1972-1985. The aircraft was used often by the Douglas Corporation to entertain guests and VIP's by giving them rides in the rare and historic aircraft. condition. The Douglas Historical Society arranged to have it towed during the middle of the night to a hanger in Long Beach where work could be done to bring it back to life. From here it was eventually sold to Brice McCan who, in turn, donated it to the Museum of Flight in Seattle in early 2000. The aircraft returned one more time to California, arriving in Van Nuys where Clay Lacy got involved and helped with the total restoration of the aircraft. This work was performed in 2005 through late 2006. Clay flew the famous DC-2 back to Seattle where it remained as a static display, still in need of much needed engine work in order to return it to operational status. Clay Lacy returned to Seattle this year and flew it back to Van Nuys again where both engines were removed and overhauled. The aircraft is now in perfect condition and owned by the Museum of Flight in Seattle, but work to return it once again to the air is being provided by Clay Lacy Aviation, Inc. The aircraft has a MGTOW of only 19,200 pounds, and is flown normally around 14,000 pounds. It holds 600 gallons of fuel, and can remain airborne for almost 8 hours. The aircraft has rarely been seen in flight at any airshows since 1985, and has never been to Oshkosh for AirVenture. This aircraft will be flown by Clay Lacy and will be one of the lead aircraft in the 40 ship mass formation arrival. It will be available for viewing and photos at KSQI July 23-25 and will be on the ground at AirVenture from July 26-31. So if having 39 DC-3s and C-47s all in one giant formation wasn't enough to get you to Airventure this year, you can now add one DC-2 to the mix. Given that 411, you have absolutely no excuse not to put this on the calendar. If you live in the Midwest, I highly recommend hanging out at KSQI on 7/24 and 7/25 the weekend before the formation flight, where the sky and ramp will be thick with everyone's favorite airframe.